Written by Apphia Campbell (Black is the Colour of My Voice) and Meredith Yarbrough, Woke is a split narrative following two black women, decades apart. Ambrosia has just moved to St Louis, in the months following the shooting of teenager Michael Brown. In her African-American literature class they are set the autobiography of Assata Shakur, a Black Liberation Army activist who was accused of killing a state trooper. Shakur was imprisoned, escaped and now lives in exile in Cuba, and her story forms the other half of the play. There are no costume changes or props to indicate the difference between the two women but sole performer Campbell makes them completely distinct; Assata has stature, Ambrosia is wide-eyed and enthusiastic. 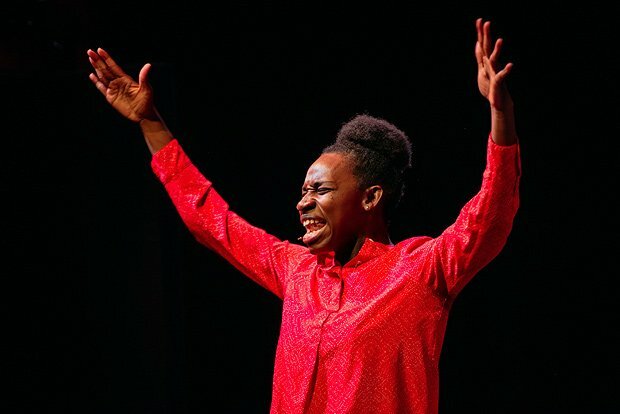 She's a formidable performer, punctuating the scenes with beautiful vocal interludes and although she occasionally stumbles over words, she succeeds in building a whole cast of characters: patronising policeman, enthusiastic teachers and activists educated in America's amendments. It is through Ambrosia that Woke so succinctly and clearly demonstrates the fundamental flaws in the American justice system: multiple, expensive fines issued, that the majority of people can't afford, and so they miss court dates and a warrant is issued for their arrest. Privileged and naive, Ambrosia initially speaks for the uninformed, asking 'don't all lives matter?' in her class debate. But when she herself attends peaceful protests and is subject to the persecution of the justice system, we truly appreciate the intolerable situation so many black individuals living in America experience. Parallels are drawn between the two time periods, between the Black Panther Party of Assata's era and the Black Lives Matter movement of present day, leaving one activist's question hanging in the air: same fight, different decades? Gilded Balloon Teviot, until 28 Aug (not 17–19), 2pm, £10–£12 (£9–£11). New story about the 20th-century African-American experience from Apphia Campbell.